A boat journey along the Thames provides the starting point for a new series of installations combining overhead projectors, glass, mirrors, lenses and videos. Through a complex process of layering and projecting, Helen Maurer produces images that cascade around the space. Objects vie with shadows and reflections to engulf the viewer into a world recalling Flemish landscape and seaside paintings. Merging real life and fiction, these worlds remain distant, inaccessible, their flickering quality echoing the essence of memory. The installations appear to dismantle themselves: images escape, shadows are transformed. Nothing remains static as human presence can easily erase and distort the images by entering the space. The artist spends months experimenting in her studio with on-going sequences creating elusive moments which eventually settle when the work is installed in a specific site. She plays with two and three dimensionalities juggling reflection, projection and refraction with everyday objects, like a magician. Helen Maurer studied at Brighton polytechnic and Central Saint Martins in London before gaining an MA at the Royal College of Art. She won the Jerwood Glass Prize in 2003. 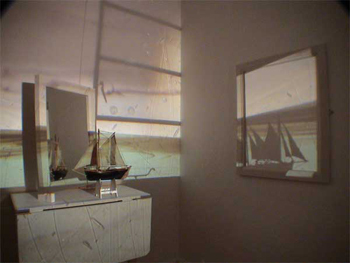 In 2005, she was commissioned to produce new work for Nelson's Anniversary at the Royal Naval Museum, Portsmouth, in collaboration with Aspex Gallery. In February 2006 she will be showing at the Institute of Contemporary Art in Singapore. The artist would like to acknowledge the support of Arts Council England for the development for this exhibition.